(1) What do you receive in a GMAT score report, including the scales of the individual scores? (2) What is the mechanism by which the answers you enter on the GMAT are interpreted and scored? (3) What skills does the GMAT measure and how can you prepare for a solid performance? You may care about only one of these or all of these. These three discussions will take us in three different directions, and you can read the sections that most concern you. Once you begin, you will be allowed an optional 8-minute break between #2 and #3 and another between #3 and #4. We certainly recommend availing yourself of both of these optional breaks. 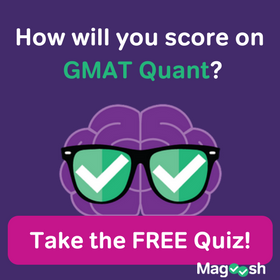 The total GMAT Score is derived from (c) and (d), from the Quant & Verbal subscores only; the AWA score and IR score have absolutely no effect on the total GMAT score. The total GMAT score, the 200 to 800 score, is certainly the most important number here, and, for some test-takers and some folks in adcom, this is the only number that matters. According to some sources, the IR section may be gaining traction as an admission tool. The AWA score is arguably the least important score on the GMAT score report. Now, a very different set of questions surrounds how the GMAT changes the answers you enter into those various scaled scores. 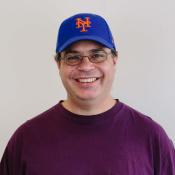 The first salient fact is that everything except the essay is graded immediately by the computer: as soon as you are done with your IR, your Quant, or your Verbal sections, the computer already knows your score. Thankfully, it doesn’t share any of this score information with you until you are done with your test. 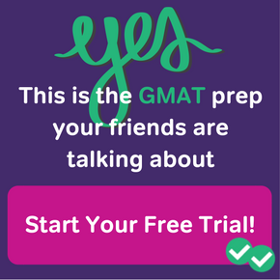 At the end of your exam, you will see your total GMAT score and every subscore except the essay. The essay takes longer to grade. It is graded once by a computer program (don’t ask us how this happens!) and once by a human grader. If those two are the same or close, that’s the AWA score. If the human and the computer disagree, a second human adjudicates and decides the AWA score. You will find out your AWA subscore when you receive your official GMAT score report, about 20 days after the test. The IR questions have a few unique features. The 30-minute IR section consists of 12 “questions,” but each “question” is really a computer screen, many of which have multiple questions. One such IR screen contains what I call multiple dichotomous choice questions (DMCQs). The screen with DMCQs will present some information, and then a box: each row will have a statement or question, and buttons to select in two columns. The columns may be “Yes/No,” “True/False,” or some other kind of simple binary choice, and your job will be to decide, for each statement or question, which button to select. Now, here’s the kicker about how IR is scored: there’s no partial credit on IR. If there are two or three separate tasks or separate questions on a single screen, you must get every single thing correct on the screen to get credit for that screen. See the link earlier in this paragraph for some of the strategies that this challenging condition implies. The Quant and Verbal sections share many features. These two are the only two sections that count in the total GMAT score. They both last 75 minutes. They both consist exclusively of 5-choice multiple-choice questions—assuming that you recognize Data Sufficiency as a modified kind of 5-choice multiple-choice question! Most important, both the Quant and Verbal employ Computer Adaptive Testing (CAT). The CAT changes the difficulty, question by question, as you move through the section. As a general pattern, if you are getting questions right, the CAT gives you harder questions, and if you are struggling, the CAT will give you easier questions. That’s the overall trend, although this highly complex algorithm also does sweeps through different difficulties: for example, you may get an easy question out of the blue even if you did nothing wrong. The grading for the CAT does NOT depend on simply the number of questions you answer correctly or incorrectly: instead, the score depends on the difficulty of the questions. The irony is that the person who gets a 450 and the person who gets a 750 might have gotten about the same number of questions right & wrong, but the difficulties were in very different zones. The complexity of the algorithm is such that it is impossible to suggest any strategy to profit from it. The only meaningful strategy on the CAT is to do your best with each and every question. Once again, CAT is employed only on the Q & V sections, not on IR and, of course, not on the AWA. You may be curious about how the GMAT determines the difficulty level of questions. In general, this is a sophisticated topic known as Item Response Theory. 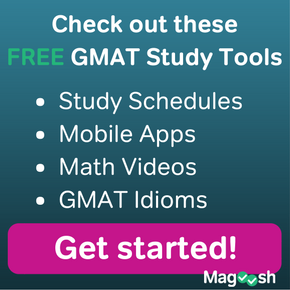 GMAC gathers a vast amount of information about individual questions before they are ever used as GMAT questions. As a general rule, I don’t think it’s helpful to worry too much about the “level” of an individual practice question. What Skills Are Assessed on the GMAT? Simplistically, we could say that the Quant assesses math skills; the Verbal assesses reading, argument, and grammar skills; the IR assesses graph-reading skills; and the AWA assesses writing skills. Of course, rhetoric and logic are as important as grammar on the SC questions. In many ways, the entire test assesses critical thinking abilities, the ability to see beyond the obvious and draw the necessary inferences from a situation. The Quant section often demands the ability to reframe problems and make creative leaps. All of the aforementioned skills could be called intellectual or academic skills. Many students mistakenly believe that this is the only category of skills relevant to a good GMAT performance. In fact, a strong GMAT performance requires emotional balance & clarity under pressure as well as tremendous emotional resilience. A rigorous practice of stress-management skills can be a tremendous aid. Arguably, the effective skill of genuine curiosity can be a particular help on the RC questions. Paradoxically, one emotional skill that can help tremendously in reaching the goal is non-attachment to reaching the goal! This blog discussed several different perspectives on “how is the GMAT scored?” The linked blogs will provide a detailed understanding of many aspects of the GMAT. If you have more questions about how the GMAT is scored, please let us know in the comment sections.